Orlan-10 UAVs in action against Ukrainian artillery 4.5 out of 5 based on 8 ratings. 8 user reviews. Turchinov also issued the standard accusations, to wit: “Russian-terrorist forces are using weapons prohibited by the Minsk Agreements in order to accurately strike our positions. It’s not just a matter of an increased number of bombardments. These are very accurate strikes, which rely on modern target acquisition and fire correction systems. ” We should note, however, that the Orlan-2S1 combo destroyed similar “weapons prohibited by Minsk agreements,” which was also about to be used “using modern target acquisition and fire correction systems,” provided by Ukraine by the US. The AN-TPQ-48 located in a single-story house, was destroyed together with the house and highly trained personnel operating the radar. This mission was accomplished using only 38 shells, instead of the 300 specified by artillery fire norms. On July 2, Poroshenko personally greeted a new batch of counter-battery radars received by Ukraine from the US. During the transfer ceremony at the Borispol airport, he said: “Today we are receiving counter-battery systems as US military aid. This batch is only part of Washington’s aid intended to strengthen Ukraine’s ability to defend itself.” He added that the counter-battery systems, valued at $335 million, are only part of the assistance the US plans to provide Ukraine. The Orlan-2S1 reconnaissance-strike complex also suppressed 3 company positions, eliminating at least 30% of personnel and equipment located at these sites, destroyed 3 Tochka-U short-range ballistic missile launchers, at least 17 tracked and 20 wheeled vehicles, two 2A36 152mm cannon, at least 3 82mm mortars, and an artillery ammunition storage. Ukrainian forces lost at least 90 killed and 220 wounded, numbers which were confirmed by the OSCE Special Monitoring Mission. A screenshot from video sent by an Orlan-10. Ukrainian equipment and troops are, typically, located in the midst of civilian dwellings. 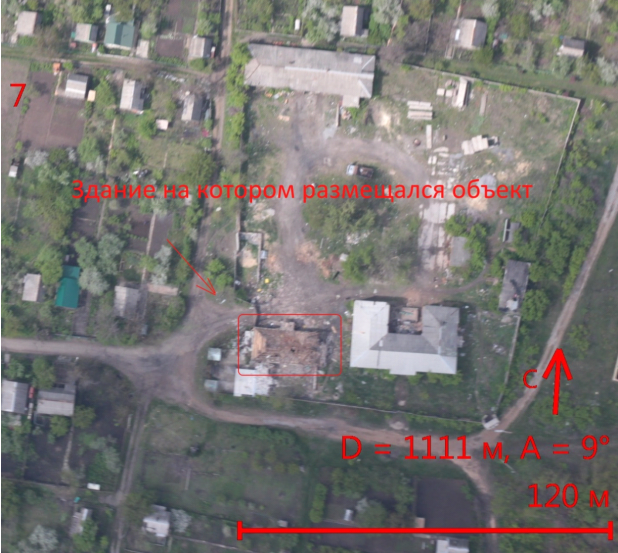 The report also contained information about the shelling of a company defensive position which struck 79th Airmobile Brigade’s Feniks Battalion’s artillery sheds in Maryinka, destroying all of its MTLB armored vehicles. Скриншот с видео, переданного БПЛА «Орлан-10» в процессе боевого применения разведывательно-огневого комплекса. Характерно, что украинская боевая техника и войска расположены непосредственно в населенном пункте. 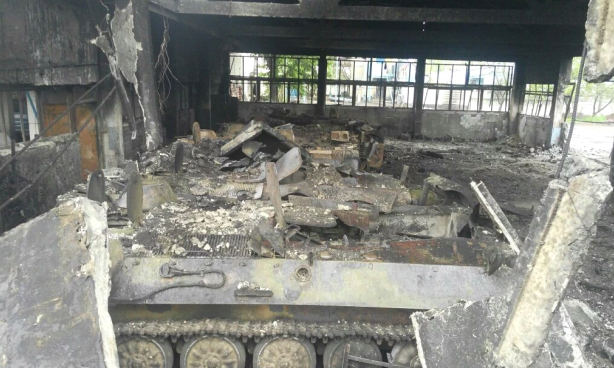 The result of shelling artillery sheds of the Feniks Battalion. May 2016. According to the report, 112 shells were launched at the position, instead of 3240 shells specified by artillery firing norms. 3240 shells wtf! Where is this norm? 3x SP batteries, 3x to annihilate rather than neutralise, x0.75 for observed fire, x1.1 for greater than 10km range, using 122mm tubes, = 450 x 3 x 3 x 0.75 x 1.1 = 3341 rounds. Looks like they rounded off to the nearest 10 and made the second 3 into a 2. Or maybe they used some Russian table that may have specified 436 rounds per battery instead of the 450 listed in the US manual and rounded. Either way, pretty close. Russian Army has extremely high density of artillery per 1km of front line. And army of DPR is formed according to Russian Army structure. So numbers looks ok.
You may start by visiting your doctor and taking the prescribed medication. This should make it a lot easier to digest the truth of inevitable demise of the US armed forces when the showdown with the Russian army begins. Bye-bye, you brainwashed members of a “indispensable” nation. No! Don’t encourage him to imbibe the poisonous products of the Globalist pharmaceutical corporations. That may be what’s wrong with him to begin with. Don’t you know psychiatric drugs make people crazy? They are a part of the plan to control the masses. Where to start? How about by supplying some actual factual evidence that contradicts something said in the article? For as many mocking comments as you make, I have not once seen you supply a shred of hard data to back any of your asinine remarks. He’s likely a paid troll, judging from his profile and comments. I never respond to those types as some get paid more if they can get people to waste time replying to their nonsense. People actually get paid for that?! Sitting at home making random comments on the internet…do you have to be cousins with someone in a Western special service or foreign/state department/ministry/office? Does Russia employ any? Because I’m sure I could produce wittier comments than Mr. Johnson. Sounds crazy to me too but it’s apparently considered a public relations position these days. Russia doesn’t employ any I know of. Israel was the first place I know of to have a paid troll squad. More countries are using them though and even corporations to try to sway public opinion, sell products, etc. Clinton is on her campaign even to supposedly “correct the record”. no paid trolls, just people being livid and bitter at something. add a few of these into the mix and even conventional artillery fire will become tremendously more accurate as if the guided rounds have been upgraded to transmit their flight data, atmospheric conditions can be calculated increasing first round hit probability. Of course there is the added bonus of the guided round producing a one shot, one kill, a very demoralizing factor. It strikes me as no small irony that the US has quested obsessively after their ‘Net-centric Warfare’ concept, at great expense, making some of their most questionable purchases (ie: F-35, Strykers) to achieve it, getting overpriced, unreliable systems that sacrifice considerable conventional capability in exchange for the privilege of being ‘Networked;” meanwhile, the Russians have quietly deployed a large number of networked systems, demonstrating effective function and well-developed operational concepts and doctrine, achieving grater results with less units fielded, without sacrificing conventional capabilities, and without the constant delays and monstrous cost overruns. And all this from as system that is supposed to be thoroughly corrupt and technological lagging. Hmmn. This is all the more remarkable when one considers that, while US defence spending declined following the Cold War, it never fell below half of it’s height under Reagan, where, accounting for inflation, it has pretty much stayed. The US never stopped seeking to have the most advanced military technology, and despite the halving, still massively outspent everybody else. Yet, here they are with a mix of robust yet very old systems, unreliable new systems, or whole sets of capability that have completely decayed and disappeared. Russian defence spending practically fell off the chart after the breakup of the Soviet Union, and while it has recovered, has never approached those levels. Yet, for the most part merely dusting off and finishing a host of late Soviet prototypes and systems that were about to go into production before cancelled by events, they have deployed more innovative, effective systems. This suggests that if the USSR had survived, and the Cold War continued, the US would have been hopelessly outclassed in practically every category by the Soviets by the late 90s.